The most innovative cases around come from Scott Dixon! These cases are superb, you pack your guitars in one super light flight case, drag it to the gig (yes wheels are included) put it on stage, take the lid off and you are ready to go! If you bring more than one guitar to a gig, you need to take a look at these cases! 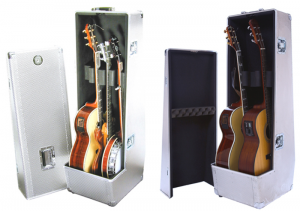 This case allows you to pack three electric guitars into one flight case. Not only is this much easier to deal with when gigging, it’s cheaper as well! Should you ever fly with your guitars, you end up only paying for one flight case rather than three. Any normal sized electric fits in this genius solution. Bass models are also available. The 2 in 1 acoustic guitar case allows you to never lose your backup. Wheels on the case make it easy to bring it with you and you never have to bring a stand ever again. We all cherish our instruments and the thought of a guitar falling over on stage causing the neck to break has most likely crossed most guitar players mind. The design of these cases is so durable that should the entire thing fall over you will most likely not damage your acoustic. This quickly becomes another huge USP for Scott Dixon cases, it’s a case-stand-protect solution. Genius! Dixon cases are made of super strong, military aluminum rather than SKBs preferred Polyethene. The result is a super strong case that should be able to handle years of abuse. I met John of ‘Dixon Cases’ at a trade show in Birmingham, the video interview contains John himself demonstrating how lightweight and durable these cases are. Should you not have three or two instruments of the same size don’t worry. The combination cases Scott Dixon offer can be custom built to your needs, allowing you to pack, for example, one acoustic, one electric and a banjo into one lightweight case that also doubles up as a stand. Out of all products I have seen in the last twenty years of seriously addictive music shop search, Scott Dixon cases offer the best solution. No doubt. Many are the players who have brought their instrument in a gig bag on tour. It usually only takes breaking one neck before a flight case is purchased. Normal flight cases are heavy and huge, should you be looking for a more compact yet indestructible design, then Scott Dixon has the solution for you with their slimline flight case range. As you saw in the video, you can put two fully grown men and a guru on top of it, no problem. Not Dixon though, the pedal case has an area under the board where you’d place the power supply and a lift up mechanism that allows the pedals to be angled more towards you. Again, sheer brilliance in design, durability, and strength.